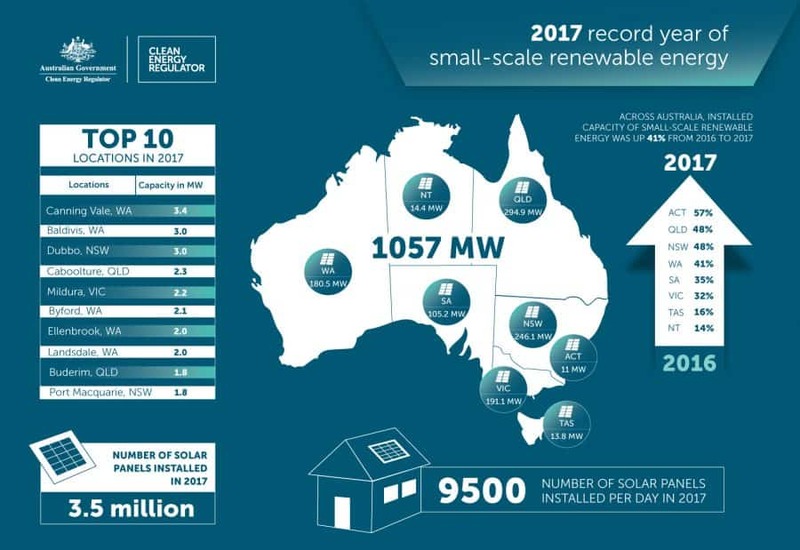 Solar Energy Australia Statistics – The Clean Energy Regulator released their report on solar power uptake in Australia in 2017. A record 3.5m solar panels were installed on rooftops last year, with their combined output of 1057MW around the same as a mid-sized coal-fired power station. Llewellyn Motors install 332kw solar system in Ipswich. “We are seeing a wide cross-section of Australians – households, community centres, schools, and small businesses – receiving incentives under the small-scale renewable energy scheme,” Williamson said. “Our data shows consumers are embracing renewable energy to take control of their electricity bills” Williams said on the CER website. According to Wikipedia, as of December 2017, Australia had over 7,024 MW of installed photovoltaic (PV) solar power. The CER report shows that in 2017 there was a 41% increase in installed renewable energy capacity compared to 2016. 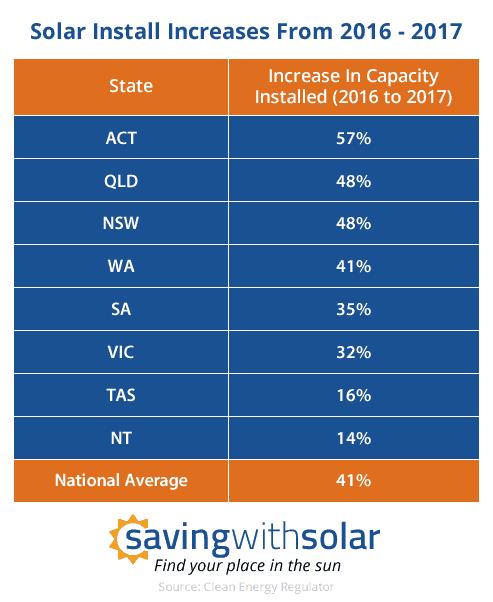 Queensland had the most solar panels installed (295MW), and the ACT showed the greatest annual increase – showing a massive 57% change from its 2016 figures. The CER report also showed that the average solar system size in Australia has increased by 200% – from 3kW to 6kw – as prices continue to decrease and technology increases rapidly. The small-scale Renewable Energy Scheme which created financial incentives for homes and small businesses to install small scale renewable energy systems has obviously had the desired effect. It’ll be interesting to see how 2018 fares as it’s already off to a roaring start. The Clean Energy Council released figures on Tuesday that show Australians’ energy needs were powered by renewables to the tune of 17.3% in 2016 – the highest since Snowy Hydro was completed 50 years ago. 3.16% of this 17.3% renewable energy was from solar power in Australia – a massive jump of 29% from 2015. According to RenewEconomy, it’s expected to grow considerably in both small and large scale solar PV production – putting us well on track to reach our Renewable Energy Targets (RET) for 2020. Clean Energy Council Chief Executive Kane Thornton advised that 10 major wind and solar farm projects were completed in 2016 and there are 20 more in the pipeline; he’s confident that we’ll reach our RETs with time to spare. “Every month brings new project announcements. While total investment in large-scale renewable energy was $2.56 billion last year, $5.20 billion worth of projects have secured finance in just the first five months of 2017 and have either started construction or will begin this year,” Thornton said. “Innovation continues right across the renewable energy supply chain and new technologies such as energy storage are beginning to get their time in the sun,” he was also quoted as saying. We assume the pun was intended. Renewable energy provided 17.3% of all Australia’s energy in 2016 – up from 14.6% in 2015. 6,750 battery systems were installed in 2016, 13 times the number installed in 2015. Hydro is still far and away the biggest contributor to Australia’s renewable energy, comprising 42.3% of the total amount. In 2017, building a renewable energy plant is now cheaper than coal and gas-fired power plants. About half of the projects already underway or set to commence in 2017 are for large-scale solar, due to price per kWh nearly halving in the last two years. Approximately 17,500 GWh of renewable energy was created in 2016 – as the Renewable Energy Target is 33,000GWh we still have a way to go but progress is looking positive. Large scale solar is almost 50% of its cost two years ago and is slated to play a huge part in reaching our RET in 2020. 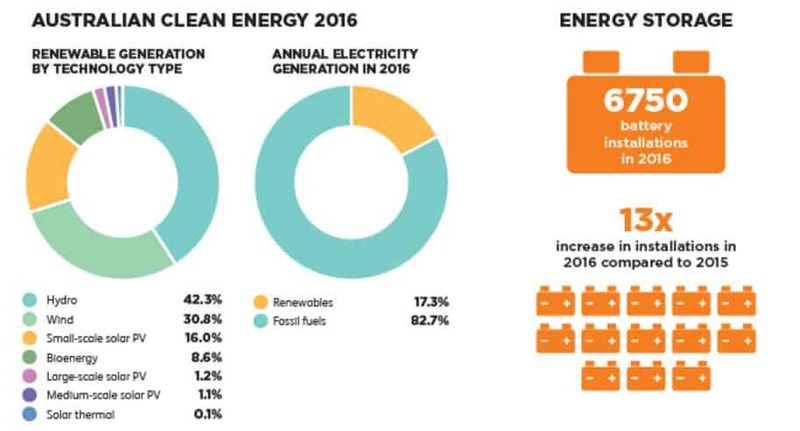 Click here to read the Clean Energy Australia Report 2016 in full at the CEC website.